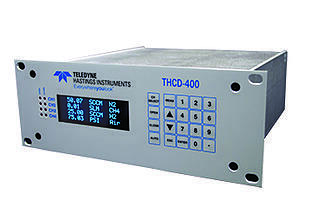 The THCD-400 is a microprocessor-based four channel power supply and controller that can operate mass flow meters, mass flow controllers, and pressure transducers as well as vacuum gauges. It provides stable output voltage levels to power these devices. The instrument accurately measures and displays output from analog transducers. In addition, it can generate analog command signals to mass flow meter controllers. For more information on the THCD-400, please complete the form on the right and we will gladly email you the Product Bulletin.